First, download and import Bolt from the Asset Store. Follow the instructions on screen to setup Bolt to your liking. If you're not an experienced programmer, we strongly suggest choosing Human Naming. Then, on the Types step, you will need to add any custom type (class or struct) that you want to use in Bolt. Note that if the type you need is inherited from Unity's object class (for example Mono Behaviours, Scriptable Objects, etc. ), it will be included automatically for you. Hit Generate and let Bolt generate the unit database. This article was helpful for 60 people. Is this article helpful for you? When I first import Bolt into my project I do not get the Setup Wizard popup so I looked it up on the documentation and it said to open it manually from the tools menu, but when I went back into Unity, I realized there was NO tools menu. How can I fix this? Select .net 4. something in build settings and restart. I would like to download the latest version of Bolt but having trouble finding where to download. I don't need to update, just starting a new project. When I go to my licenses there is no download option, when I go to the Asset Store it wants to charge me again, and when I check my initial order email there is no direct link. How do I get the newest version without paying again? Thanks. Hey Dan. Best to move this to a PM to Lazlo or Questions/Bugs. Not sure whats up with the asset store, have you tried contacting them? If you go here https://ludiq.io/bolt/builds with your invoice # though, 1.3.0 at the top should be exactly what you would get from the asset store. Hey William, the download link worked fine, thanks. Does it work with latest unity versions as the other one wanted only 2017 unity.. if it doesnt Ludiq needs to get that done and then please add trail renderer access to particle systems..
Bolt requires a minimum of 2017.1 or above and should work with any stable release. As for Unity 2018, Supporting/fixing issues with a beta version is not his priority. If you are having issues accessing units for Trail renderer or particle system pls post in questions here or on Discord and any # of us will he happy to help. Please post a bug report or question on the forum if you need assistance; I don't believe I've seen any ticket regarding incompatibility. A common cause for the missing tools menu is that your project doesn't compile in the first place. If you have errors in the console unrelated to Bolt, it can't initialize at first. Fix those and the Bolt setup wizard should show up. unity 2017.4.2f2 installation goes smoothly. Hi. Just got some new stuff for my project and I want to add the Assembly using the Bolt Setup Wizard. Also - this may help. With the Generate Documentation. It hangs. If I click the TaskManager (Windows 10) and then click Unity3D it continue - very weird. I yet to see a full Generate Documentation go to the end with no errors. Always errors out on the Editor (Second Pass). /p:Configuration=Debug /p:GenerateDocumentation=true /p:WarningLevel=0 /p:DocumentationFile="E:\1-Projects\Unity3D\Perpendicular War\Assets\Ludiq\Ludiq.Core\Generated\Documentation\Assembly-CSharp-Editor.xml" "E:\1-Projects\Unity3D\Perpendicular War\Assembly-CSharp-Editor.csproj"
Build started 27/05/2018 3:32:23 PM. Project "E:\1-Projects\Unity3D\Perpendicular War\Assembly-CSharp-Editor.csproj" on node 1 (default targets). Project "E:\1-Projects\Unity3D\Perpendicular War\Assembly-CSharp-Editor.csproj" (1) is building "E:\1-Projects\Unity3D\Perpendicular War\Assembly-CSharp-firstpass.csproj" (2) on node 1 (default targets). Copying file from "F:/Program Files/Unity/Editor/Data/MonoBleedingEdge/lib/mono/unity/Boo.Lang.dll" to "Temp\bin\Debug\Boo.Lang.dll". Copying file from "F:/Program Files/Unity/Editor/Data/MonoBleedingEdge/lib/mono/unity/mscorlib.dll" to "Temp\bin\Debug\mscorlib.dll". Copying file from "F:/Program Files/Unity/Editor/Data/MonoBleedingEdge/lib/mono/unity/System.Core.dll" to "Temp\bin\Debug\System.Core.dll". Copying file from "F:/Program Files/Unity/Editor/Data/MonoBleedingEdge/lib/mono/unity/System.dll" to "Temp\bin\Debug\System.dll". Copying file from "F:/Program Files/Unity/Editor/Data/MonoBleedingEdge/lib/mono/unity/System.Runtime.Serialization.dll" to "Temp\bin\Debug\System.Runtime.Serialization.dll". Copying file from "F:/Program Files/Unity/Editor/Data/MonoBleedingEdge/lib/mono/unity/System.Xml.dll" to "Temp\bin\Debug\System.Xml.dll". Copying file from "F:/Program Files/Unity/Editor/Data/MonoBleedingEdge/lib/mono/unity/System.Xml.Linq.dll" to "Temp\bin\Debug\System.Xml.Linq.dll". Copying file from "F:/Program Files/Unity/Editor/Data/MonoBleedingEdge/lib/mono/unity/UnityScript.dll" to "Temp\bin\Debug\UnityScript.dll". Copying file from "F:/Program Files/Unity/Editor/Data/MonoBleedingEdge/lib/mono/unity/UnityScript.Lang.dll" to "Temp\bin\Debug\UnityScript.Lang.dll". Copying file from "F:\Program Files\Unity\Editor\Data\MonoBleedingEdge\lib\mono\unity\Boo.Lang.PatternMatching.dll" to "Temp\bin\Debug\Boo.Lang.PatternMatching.dll". Copying file from "F:\Program Files\Unity\Editor\Data\MonoBleedingEdge\lib\mono\unity\Boo.Lang.Useful.dll" to "Temp\bin\Debug\Boo.Lang.Useful.dll". Done Building Project "E:\1-Projects\Unity3D\Perpendicular War\Assembly-CSharp-firstpass.csproj" (default targets). Project "E:\1-Projects\Unity3D\Perpendicular War\Assembly-CSharp-Editor.csproj" (1) is building "E:\1-Projects\Unity3D\Perpendicular War\Assembly-CSharp.csproj" (3) on node 1 (default targets). Done Building Project "E:\1-Projects\Unity3D\Perpendicular War\Assembly-CSharp.csproj" (default targets). Project "E:\1-Projects\Unity3D\Perpendicular War\Assembly-CSharp-Editor.csproj" (1) is building "E:\1-Projects\Unity3D\Perpendicular War\Assembly-CSharp-Editor-firstpass.csproj" (4) on node 1 (default targets). Copying file from "F:/Program Files/Unity/Editor/Data/MonoBleedingEdge/lib/mono/2.0-api/Boo.Lang.dll" to "Temp\bin\Debug\Boo.Lang.dll". Copying file from "F:/Program Files/Unity/Editor/Data/MonoBleedingEdge/lib/mono/2.0-api/mscorlib.dll" to "Temp\bin\Debug\mscorlib.dll". Copying file from "F:/Program Files/Unity/Editor/Data/MonoBleedingEdge/lib/mono/2.0-api/System.Core.dll" to "Temp\bin\Debug\System.Core.dll". Copying file from "F:/Program Files/Unity/Editor/Data/MonoBleedingEdge/lib/mono/2.0-api/System.dll" to "Temp\bin\Debug\System.dll". Copying file from "F:/Program Files/Unity/Editor/Data/MonoBleedingEdge/lib/mono/2.0-api/System.Runtime.Serialization.dll" to "Temp\bin\Debug\System.Runtime.Serialization.dll". Copying file from "F:/Program Files/Unity/Editor/Data/MonoBleedingEdge/lib/mono/2.0-api/System.Xml.dll" to "Temp\bin\Debug\System.Xml.dll". Copying file from "F:/Program Files/Unity/Editor/Data/MonoBleedingEdge/lib/mono/2.0-api/System.Xml.Linq.dll" to "Temp\bin\Debug\System.Xml.Linq.dll". Copying file from "F:/Program Files/Unity/Editor/Data/MonoBleedingEdge/lib/mono/2.0-api/UnityScript.dll" to "Temp\bin\Debug\UnityScript.dll". Copying file from "F:/Program Files/Unity/Editor/Data/MonoBleedingEdge/lib/mono/2.0-api/UnityScript.Lang.dll" to "Temp\bin\Debug\UnityScript.Lang.dll". Copying file from "F:\Program Files\Unity\Editor\Data\MonoBleedingEdge\lib\mono\2.0-api\Boo.Lang.PatternMatching.dll" to "Temp\bin\Debug\Boo.Lang.PatternMatching.dll". Copying file from "F:\Program Files\Unity\Editor\Data\MonoBleedingEdge\lib\mono\2.0-api\Boo.Lang.Useful.dll" to "Temp\bin\Debug\Boo.Lang.Useful.dll". Done Building Project "E:\1-Projects\Unity3D\Perpendicular War\Assembly-CSharp-Editor-firstpass.csproj" (default targets). Done Building Project "E:\1-Projects\Unity3D\Perpendicular War\Assembly-CSharp-Editor.csproj" (default targets) -- FAILED. I could not successfully get my Bolt installed on the Unity v2018.2.6. So that I uninstalled Unity (v2018.2.6.f1) and reinstalled it's v2018.1.0f2 on my computer. When I re-import Bolt from Asset Store. I got the following error msg after I pressed the "Generate" button at [generate documentation] phase. The message is listed below. /p:Configuration=Debug /p:GenerateDocumentation=true /p:WarningLevel=0 /p:DocumentationFile="C:\Users\beely\Documents\UnityProjects\NewPicture\Bolt4\Assets\Ludiq\Ludiq.Core\Generated\Documentation\Assembly-CSharp.xml" "C:\Users\beely\Documents\UnityProjects\NewPicture\Bolt4\Bolt4.csproj"
Build started 9/1/2018 7:06:55 PM. Project "C:\Users\beely\Documents\UnityProjects\NewPicture\Bolt4\Bolt4.csproj" on node 1 (default targets). Done Building Project "C:\Users\beely\Documents\UnityProjects\NewPicture\Bolt4\Bolt4.csproj" (default targets) -- FAILED. After couple times of tryout, I decided to give up [generate documentation] phase and pressed Next button go to the phase of [Generate Inspectors]. The screen held several seconds at [Assembly option] then jumped back to the Bolt Welcome page. Btw, the Console kept prompt the following msg during the import process. Create them with 'Tools > Bolt > Unit Options Wizard...'. Is there anyone could help me to solve out this issue? 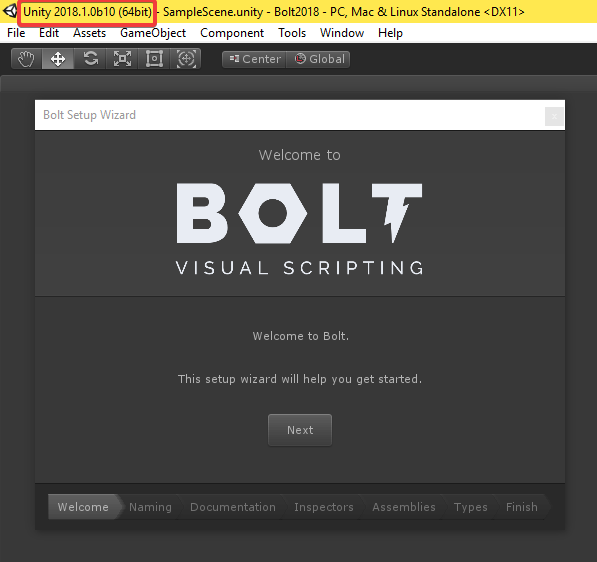 I have done many researching on visual programming and I picked Bolt eventually. Nevertheless, the installation of Bolt blocked me from using it. Hey Bolt tech guys, please don't disappoint me. Thanks and look forward to hearing from you soon. Additionally, although I skipped all phases and went to the [Type Options], and pressed the [Generate] button. The installation still failed. Here were those error messages showed at the Console.